San Diego Regional Chamber of Commerce. 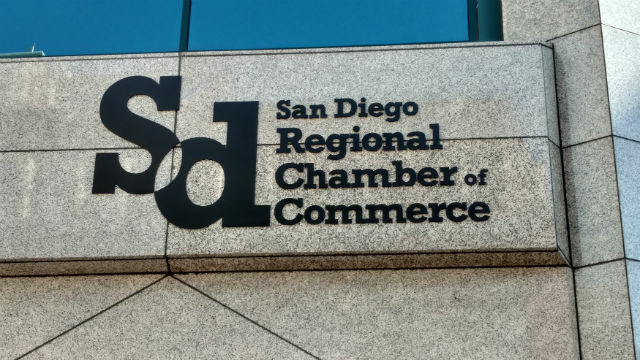 The San Diego Chamber of Commerce‘s monthly business outlook index — released Friday — plunged to the lowest level in its three-year history, with less than one in five members surveyed expected to hire more employees in the near future. In the survey taken in the last two weeks of October, more than 200 chamber members were asked questions about their business expectations over the next few months, including hiring. Only 16 percent expected to add employees during the period. The category had never been below 25 percent. The result drove the chamber’s monthly index — which ranges from plus-100 to negative-100, with zero being neutral — down by nearly half, falling into single digits for the first time ever at 9.3. The index has been on a roller coaster ride most of this year, but the overall trend has been down. “October has traditionally been a weaker month and we have seen this declined sentiment growing for some time. But I am optimistic that what we are witnessing this month is businesses taking a more wait-and-see approach and we’ll see a rebalanced and more positive outlook in the coming month,” said Dino D’Auria, executive vice president and chief banking officer at Silvergate Bank, which sponsors the survey. Businesses were also asked whether they expected to increase or decrease their workers’ hours, earn more or less revenue, and expect improving or worsening business conditions. Only 7 percent expected to shed employees, while 11 percent planned to reduce worker hours. Another 14 percent said they would increase hours, according to the chamber. According to the survey results, around half the transportation businesses surveyed anticipate declining revenue in the next few months, while hospitality establishments are preparing for lower revenue, a tightening of work hours and a bleak hiring picture.